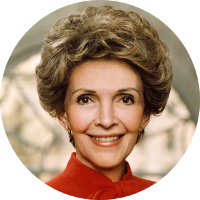 Nancy Reagan was an American actress and First Lady of the United States. She was married to President Ronald Reagan. Nancy Reagan was born Anne Frances Robbins in 1921, but was often called Nancy from early on. Her mother remarried and in 1935, her stepfather formally adopted her, legally changing her name to Nancy Davis. In 1949, Nancy Davis met Ronald Reagan while he was president of the Screen Actors Guild. Although they both continued their acting careers after they were married, they would only star in one movie together, Hell Cats of the Navy in 1957. Nancy Reagan was awarded the Presidential Medal of Freedom, the United States highest civilian award, by President George W. Bush in 2002. She died in 2016. Nancy Reagan has a number of former U.S. Presidents in her family tree. These include John Adams, John Quincy Adams, Franklin D. Roosevelt, Millard Fillmore, Rutherford B. Hayes, Grover Cleveland, Gerald Ford, William Howard Taft, Ulysses S. Grant, Calvin Coolidge, Benjamin Harrison, Richard Nixon, and both Presidents Bush. Her fellow First Ladies that she is related to include Ellen Wilson, Florence Harding, Edith Roosevelt, Bess Truman, Mamie Eisenhower, and Barbara Bush. She also has a connection to the current royal family through the late Princess Diana. One of the more ironic family connections for Nancy Reagan is a family connection to John Hinckley Jr., the man who tried to assassinate her husband just two months into his presidency. Other infamous kin of Nancy Reagan include Alexander Hamilton’s killer Aaron Burr, notorious outlaw leader Wash Loomis, and John Lennon’s killer Mark David Chapman. Some of her more prominent kin included Revolutionary War hero Ethan Allen, abolitionist John Brown, painter John Trumbull, gunfighter and lawman Wild Bill Hickok, stained glass artist Louis Tiffany, inventor Thomas Edison, artist Norman Rockwell, and aviation pioneers Amelia Earhart and the Wright brothers. Nancy Reagan also has kinship to numerous celebrities including, but not limited to, Roy Rogers, Humphrey Bogart, Katharine Hepburn, Matt Damon, Ben Affleck, Jodie Foster, Ken Burns, Kyra Sedgwick, Richard Gere, Bill Paxton, Ted Danson, Jane Fonda, Raquel Welch, John Lithgow, Clint Eastwood and many others.